Some French liaisons are forbidden: they aren’t—can’t be—pronounced even in the most formal French. Sometimes this is to avoid confusion with similar expressions, sometimes it has to do with a sort of respect for names and foreign words, and other times there’s no apparent logic to it. * Note that the pronunciation of the z in onze at the beginning of enfants is enchaînement, not a liaison. if there’s no liaison after toujours, why is it pronounced tou-jou-REH-mabl? 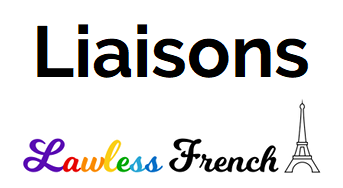 Liaison is only with normally silent letters, like the “s” at the end of toujours. The “r” in toujours is always pronounced. When that happens – when a sound that is always pronounced is attached to the next word – that is called enchaînement.